Canoes and kayaks are popular among watersport lovers and outdoor enthusiasts, but they are far from new. Canoes, which were widely used among Native Americans and the Aboriginal People of Australia, get their name from their hollowed out shape. The name kayak comes from the Native Alaskan name for their small hunting boats. Both canoes and kayaks were typically made by hand from whatever materials were available. Now, modern versions of canoes and kayaks are often made using plastics, fiberglass, Kevlar, or other impact-resistant materials. In parts of the world, it is common to refer to both kayaks and canoes simply as canoes. While this nomenclature may be somewhat confusing, it is not difficult to see why they may be grouped together. Both canoes and kayaks are small boats that accommodate only a few passengers. They tend to be long and narrow and are typically pointed at the ends. Canoes and kayaks are lightweight and have no motors or sails, rather, they are propelled by the occupant using a paddle. 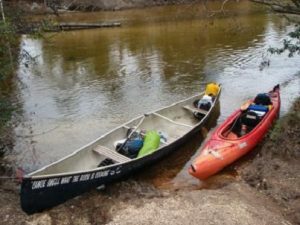 Both kayaks and canoes can vary in length and design depending on their intended use, and there are very few instances where there is not both a canoe and kayak option available. Despite the similarities, it is relatively easy to distinguish between a canoe and a kayak. Design: Possibly the most striking difference between canoes and kayaks is that canoes are open at the top while kayaks are typically covered having only a small opening for the occupant to climb in through. Seating Positions: Kayak passengers sit lower in the boat than canoe passengers. In a kayak, the passenger typically sits down at the very bottom of the boat while canoes often have seats that are up off the bottom of the boat. Paddles: While both canoes and kayaks are propelled with paddles, canoe paddles have a blade at one end while kayak paddles have blades at both ends. One reason for the double-sided paddles is thatmost kayaks are designed to be used by one person at a time. This, coupled with the low-seated position of the paddler would make it very difficult to use a one bladed paddle in a kayak. Size and Purpose: While there are single-passenger canoes, it is common for a canoe to be designed to seat two or more people at a time. Canoes are larger than kayaks, in general, with expedition and tripping canoes having typical lengths of more than 16 feet while kayaks that are designed for the same purpose may only be 12 feet long. The smaller size of the kayaks often means that they are faster and easier to maneuver than canoes. Specialized kayaks meant to be extremely maneuverable may even be as short as 5 feet, but this maneuverability does come at a cost. The extra length of canoes tends to make them hold their course or travel in a straight line better than kayaks. In addition, the larger size of the canoes means that they often have more room for supplies on longer trips. While modern kayaks and canoes have similar shapes, are often made out of the same materials, and can both be used for tripping down a river, peacefully paddling around a lake, camping, fishing, racing, and even white water adventuring, there are a few key differences that make them easy to distinguish. In short: Kayaks are typically smaller than canoes, they are closed at the top with only a small opening, the occupant sits down at the bottom of the boat, and the paddles will have blades at both sides. On the other hand, canoes will often be longer than kayaks, they are open at top, usually have raised seats for the occupants, and the paddles usually only have a blade at one end.